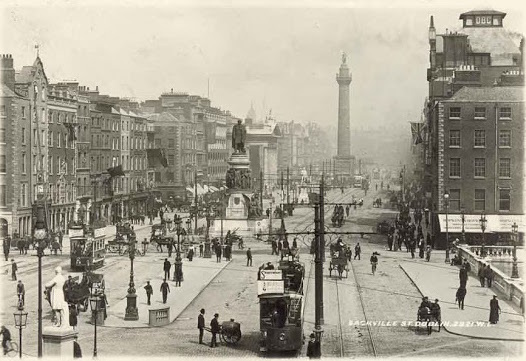 Sackville Street, or O`Connell Street as it is known today, is a pivotal location given its size and central location. The street was the setting for a great deal of the chaos which enveloped Dublin in the events of Easter 1916. Interestingly, the street was subjected to destruction by both Irish and British factions. The local Irish residents contributed to the mayhem by breaking into local shops and businesses and ransacking the premises for food and other provisions. The British military contributed in an entirely different manner, unleashing rounds of gunfire upon the street from the Helga, a gunship which was docked near where O`Connell bridge stands today. This was combined with other pieces of artillery positioned outside Trinity and together they left Sackville Street in absolute ruin. The Metropole Hotel, which stood in front of the GPO, in particular was absolutely consumed by hails of bullets in attempts by the British military to uproot the rebels from their base at the GPO. Today, Penney’s occupies the building which once housed the Metropole Hotel.